By Srinivas Chowdary Sunkara // petrobazaar // 11th February, 2019. Brent rose 47 cents to $62.1 and WTI futures moved 8 cents up to $52.72 a barrel after a choppy trading on Friday. U.S crude slumped 4.65 pct and Brent lost around 1 % during the week. Weaker economic data and Strong dollar continued to weigh on oil prices while sanctions on Venezuela and OPEC+ supply cuts extended support. U.S - China trades dispute remained unresolved denting the global economic growth weighed on financial markets, spilled over to oil markets. 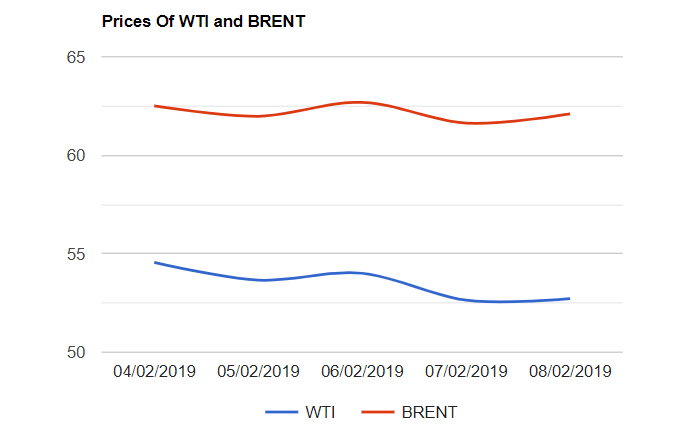 The macro factors of the supply fundamentals remain fragile, it seems as the Rosneft head is in the opinion that the Moscow's deal with the OPEC to rein in oil supplies is a strategic threat and plays into the hands of the U.S.. Turning to Rig numbers, U.S added another 7 rigs into drilling industry, Pointing to a further rise in oil production. Today, Asian markets are opened in red. Monthly reports are due in this week along with the weekly numbers which may spur some volatility in the market. Good day.